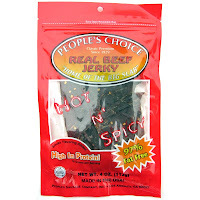 People's Choice Beef Jerky is a brand of People's Sausage Company, Inc., based out of Los Angeles, CA. It's a family-run business that's been around since 1929 originally focusing on sausage, and then moving into restaurant distribution. It wasn't until recent years when the founder's grandson took over the business and branched into beef jerky. I actually reviewed this brand two years ago, reviewing their Premium Teriyaki Beef Jerky. This "Hot N' Spicy" is part of the company's "Classic Premium" line which appears to be the company's flagship line, and is one I've typically seen in local retail outlets here in SoCal. Beef, soy sauce, sugar, worcestershire sauce, liquid smoke, cracked red pepper, onion powder, garlic powder, pepper and sodium nitrite. The first thing I notice on the surface of these pieces is a light sweetness, and a bit of that liquid smoke. Some of the red pepper brings on a light burn, and there's a light bit of saltiness too. The chewing flavor starts with a little bit more sweet, and a little bit more saltiness. There's a touch of seasoning noticeable, particularly black pepper. The heat from the red peppers builds up a little bit more. For being labeled as "Hot N' Spicy", it seems to stand up to that description. Based on my taste buds, it's not really that hot, more like medium (level 3 out of 5), but to others it could be hot. There's also a spiciness to it, aside from the heat. It's mostly as a black pepper flavor, but I can also pick up light amounts of the garlic and onion. But while I can pick up a medium level of burn from the red peppers, I only taste a light amount of the red pepper flavor. Some pieces seems to have a little more flavor. However the flavor that seems to define this jerky is actually the sweetness. That's the flavor I keep tasting more than any other. It's noticeable on the surface and seems to build up a little bit more in the chewing. The black pepper is perhaps the second-most noticeable, with the light garlic & onion after that. The natural meat flavors vary between non-existent to light. 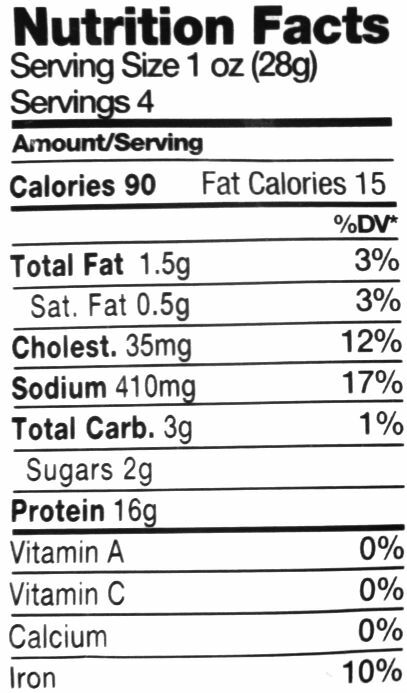 Where I do get a light flavor, it's more of a fatty, beefy flavor than anything else. Overall, what you're going to notice in this jerky is a sweetness that starts on the surface and strengthens in the chewing, as well as a black pepper flavor, and lighter amounts of garlic & onion. You'll get a medium level of heat and a medium level of saltiness. These are slices of whole meat, sliced into thin slabs, and in medium sized pieces. This is a dry jerky with a dry surface feel. Some slabs are very flexible while others are stiff and hard. Some pieces were rather tough to tear apart, while others were very easy. Chewing is similar, with some being tough, and others being very easy. The chewing texture starts out feeling pliable, and somewhat plastic-like, with a light amount of chewing resistance in the softer, flexible slabs. The tougher slabs start out feeling hard with a lot of chewing resistance. The softer slabs tend to feel more like real meat, though a bit mushy. The harder slabs end up feeling chunky and crumbly. I'm not seeing any bits of fat on these slabs, but I do see small lines of gristle running through these. None of the gristle provided any rubbery or crunchy chewing however. I didn't encounter any stringiness or unchewable wads of tissue. In terms of clean eating, I didn't find any residue on my fingertips, but I did get a fair amount of meat fragments and pepper bits flying off as I ripped off chunks. I paid $5.99 for this 4oz package at a Mobil Station in Temecula, CA. That works out to $1.50 per ounce. You can also buy it online at the brand's website at a price of $16.00 for four packages, which comes out to $1.00 per ounce. I don't know what the shipping costs are. 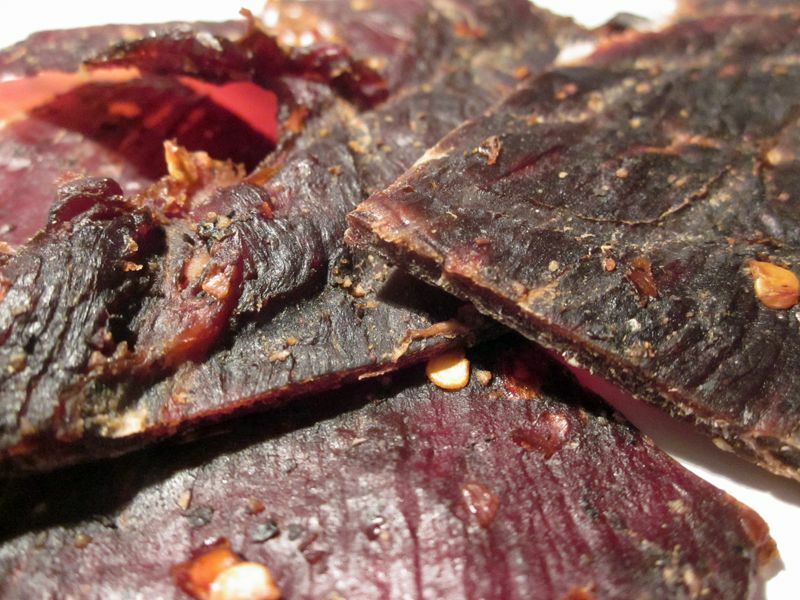 But for general jerky snacking purposes at the $1.50 per ounce price, it's a good value. I'm getting a decent amount of snackability due to a satisfactory flavor, and a fair amount heat and spiciness, though a mixed meat consistency. That's still a little cheaper than the major brands of jerky you find at the grocery store, but yet a comparable snackability. As a "Hot N' Spicy" beef jerky, at the same $1.50 per ounce price, it's a decent value. I do get a medium level of heat, and a fair amount of spiciness, which is probably about what you'd get from the major brands of jerky, and yet at a price that's slightly lower. 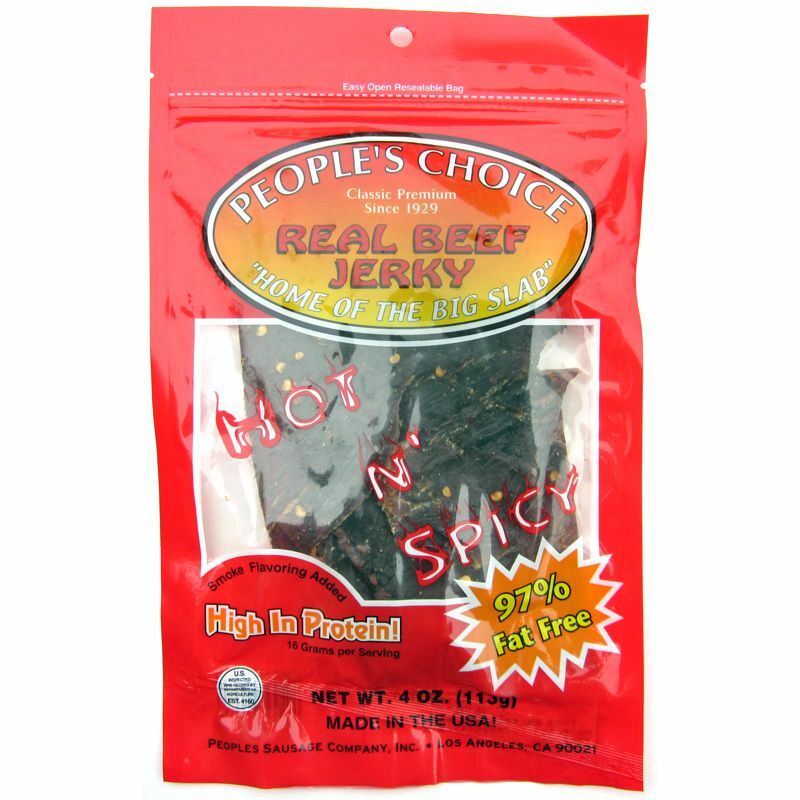 This Hot N' Spicy variety from People's Choice Beef Jerky does give out a medium level of heat and a fair amount of spiciness from a dose of black pepper and lighter amounts of garlic & onion. 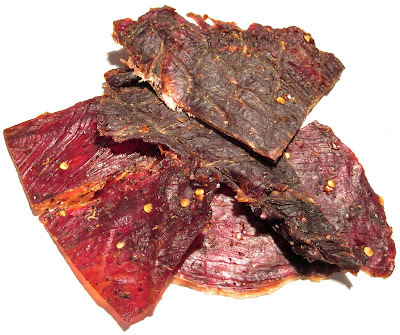 But those flavors don't really define this jerky, it's largely a flavor based on a combo of sweetness and black pepper. I'm not really getting much natural meat from this. Where I do pick up some, it's mostly a fatty, beefy flavor, not really anything like steak. In comparison to the hundreds of other brands of jerky I've reviewed, I'm not seeing anything with this that stands out and makes it above average. The meat consistency is mixed with some being easy, but others being tough and not really chewing like real meat. 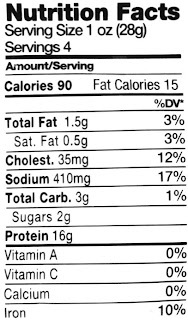 But this jerky still has enough flavor, and still seems to stand up to its advertised flavor that I feel compelled to keep eating, and that was enough to warrant at least a three-star rating. As for my recommended beer pairing, I think I would like a maltier pale ale, perhaps Widmer's Drifter Pale Ale or Firestone's Double Barrel Ale.